The bakery line at Knaus Berry Farm the morning of Christmas Eve. Hours later, the customers emerge. 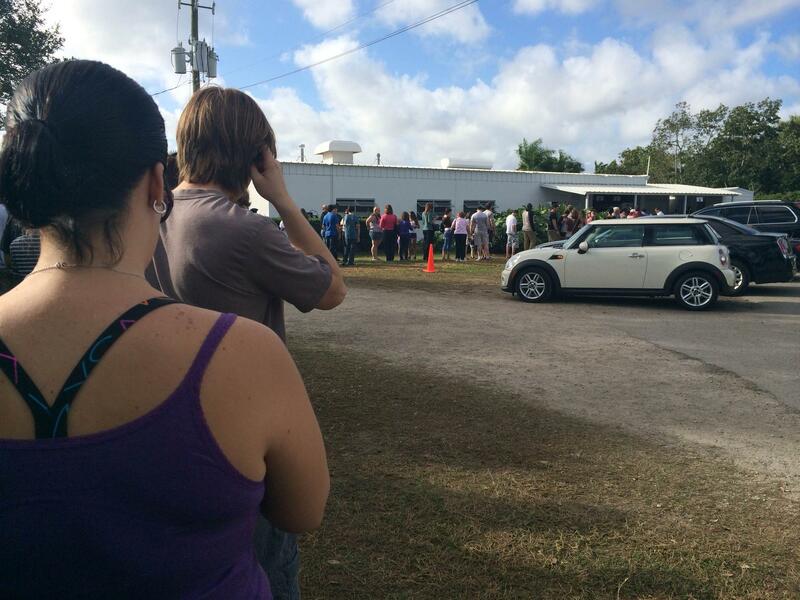 Reporter Rick Stone braves the line for Knaus Berry Farm's cinnamon buns on Christmas Eve. Señora Lilian helped my mom navigate our new country: telling my mom what her favorite grocery stores were, teaching her tidbits of Cuban culture that would come in handy through our life here, and taking her to "the Amish." That's what most South Floridians call the family who runs the Knaus Berry Farm in the Redland. They're actually German Baptist, but some of the older Knauses wear bonnets and long beards, so they're often mistaken for Amish. Señora Lilian took us there for the cinnamon rolls. They were exquisite. Gooey, aromatic, four-inch rolled squares of fluffy dough baked with cinnamon and glazed with something you shouldn't eat more than once a year, for your waistline's sake. During the holiday season, they drive people to the farm likes bees to honey. The smell of fresh-baked rolls seems to waft seductively through the air surrounding the long lines that reach into the parking lot, offering encouragement to those who still have hours to go before ordering their share. The bakery line at Knaus Berry Farm the day before Christmas Eve. I don't know what it is about the Knaus Berry Farm cinnamon rolls that keeps people flocking back. I know my mom got hooked on them in our Hollenbeck years, and ever since they've heralded Christmas in our house. The farm is only open from November through mid-April. So its opening signals the holiday season to me much more than Miami's lack of change in weather. When I go over my mother's house and smell the sugary treats, I know Christmas is coming. And on a recent visit to the farm the day before Christmas Eve, I realized: These sticky buns are what made me feel like a Miamian. Just like everyone else in the three-hour long line that morning, I'd been going there every year to pick up the absolutely necessary component of my holiday meal. I've never had lechón cooked in a caja china -- I know, I know -- and I don't know how to make hallacas. But thanks to my mom and Señora Lilian, I do partake in one Miami Christmas tradition: standing in line for Amish cinnamon buns.